For additional information on how to join, please feel free to contact Matt Jones at 857-301-9044. The common term for a group of workers looking to join a union is “Organizing.” Workers organize for various reasons, be it to improve their working conditions, increase their pay or benefits, and/or to create a better working environment. 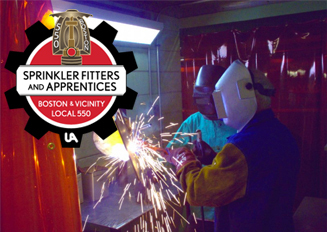 Sprinkler Fitters Local 550 encourages you to read more about us to see if joining our union is right for you and/or your coworkers. Our Founder’s Mission was to achieve unity of action among all workers in the industry, to meet the needs of construction workers, and to elevate the conditions of life and labor for working people. We must honor, respect, and never forget their sacrifices and dedication to our industry. We must continue their fight for working people and never let the union die. The minimum wage in NY State is $6.75 per hour; however wages of $8 per hour are common. For most of these workers there is no health insurance or retirement plans. The result? Taxpayers across the United States are making up for what employers should be paying with public assistance programs. That’s corporate welfare.